Parker. Jason Statham doing what he does best: fighting people and making them look bad! Oh, and gettin’ the girl. Only this time his former fellow “code of honor” heist group members have already tried to kill him, he wants revenge along with his cut, and the girl is none other than Jennifer Lopez. This action film that looks like so many others adds itself to the list on January 25, 2013. The Silver Linings Playbook (trailer#2). This second trailer for this promising film starring Bradley Cooper, Robert DeNiro, Jennifer Lawrence, Chris Tucker and more gives a little bit more insight into the “crazy.” I’m pretty interested in seeing this movie about a troubled man and former teacher that, after a time in a mental institution, moves in with his family and finds himself attracted to a local young lady with her own troubling problems. Open up the playbook of life on November 21, 2012. The Croods. DreamWorks Animation’s response to Pixar’s Brave? Perhaps. There is a self-reliant, semi-rebellious, redheaded daughter who’s defiant adventure brings about an unexpected turn of events for her family. Only thing is, they’re not in Kansas anymore, Dorothy! Follow the story of the cavemen brood as the story of the Croods hits theaters on March 22, 2013 with the vocal talent of Nicolas Cage (might be the best thing he is in for a while), Ryan Reynolds (see previous comment for Cage), and Emma Stone! The First Time. This romantic comedy centers around a guy and a girl that like each other but are in relationships (or in the pursuit of one) with someone else. Releasing this month with a cast of relative unknowns, this film looks to grab the attention of a certain demographic and has the look and feel to do so successfully. The Guilt Trip. I never would’ve thought to pair Barbra Streisand and Seth Rogen together in a movie, but, then again, I never would’ve paired up Sandra Bullock and Ryan Reynolds either. The director that brought us the fun rom-com, The Proposal, brings another comedy about a mother and son who unintentionally begin to build up an underdeveloped bond when they embark upon a cross-country road trip. This trip looks to be so awkwardly fun. Look for it on Christmas day 2012. UPDATE: A Good Day To Die Hard. New teaser trailer just hit the web for the next Die Hard film starring Bruce Willis! Check it out! I looks fun! 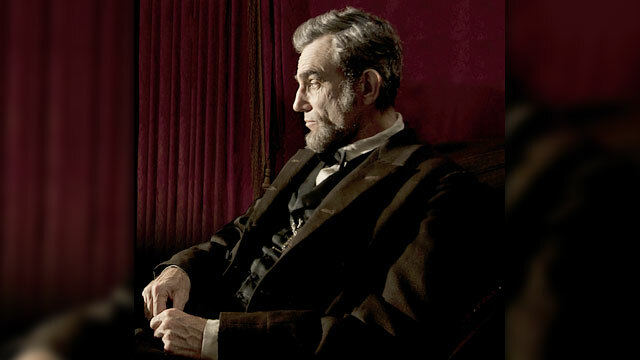 Enjoy this amazing 2min TV spot for Spielberg’s Lincoln. It aired after last night’s U.S. Presidential debate. Lincoln stars Daniel Day-Lewis, Joseph Gordon-Levitt, Tommy Lee Jones, Sally Field, Jared Harris and more. Look for it in theaters on November 16, 2012. It look so good! My favorite trailers from today: The Croods, Lincoln, A Good Day to Die Hard, and The Silver Linings Playbook. Which ones are your favorites?? Limited Release: The Paperboy, V/H/S, The Oranges and more. With regard to that ‘Parker’ trailer, I see studios are still in their remake mode. This is the third rehash of Richard Stark’s (aka Donald Westlake) ‘The Hunter’ novel adopted to the screen. The first being John Boorman’s ’67 ‘Point Blank’ with Lee Marvin, then Mel Gibson’s ‘Payback’ back in ’99. At least this time, they’re using the character’s name in the film. I’m not familiar with The Hunter. Thanks for that tidbit. I will have to look it up. Do you think the movie will be any good? It’s a debut story for one of the seminal criminal characters in crime lit by author Stark/Westlake. Parker is a fascinating anti-hero and Donald Westlake wrote a whole series on the guy. This has potential in film as a fine series, but we’ve only seen filmmakers come back to that first book. BTW, if Donald Westake doesn’t ring a bell with you, he has adapted his and other’s work in film screenplays. Most notably, he wrote the adaptation of Jim Thompson’s book that was turned into Stephen Frears’ stellar film, THE GRIFTERS. Nice! thank you. I am unfamiliar with Westlake as well and will be looking him up tonite (I’m on my way to work now). Even if I wasn’t already predisposed against The Lone Ranger thanks to the whole Johnny Depp fake Indian makeup thing, that trailer did not impress. Actually surprised that most of the trailers look all right, though; maybe not a lot of great films in there, but most ought to be at least worth watching from what’s shown here. The Croods isn’t really exciting me with the plot, but the scenery looks pretty. Lincoln trailer seemed very overwrought. I can’t wait to see more from The Croods only because the story doesn’t tell us too much to be excited over, you’re right. FEBRUARY for Die Hard? Eesh. Not a lot of confidence… not even a march realease, huh? Yeah. February usually means they hope to be the best worst movie of the month. I have to catch up on trailers tonight. Btw, glad I didn’t see Movie 43 red band trailer here. I don’t care that Gerry Butler is in it, that trailer is so crude and foul mouthed. I’m not sure I could watch it even with all that cast. i saw that trailer and knew that I couldn’t put it here as I try to keep this site family-friendly. It is online for those who wish to see it, but not here. Btw, I just noticed the Recommended Posts on your sidebar. Thanks for including my posts, T, how very kind!! Have a blessed weekend. My interest in the Die Hard series declines as each sequel releases. maybe this one will be okay. I’m with you on the lone ranger trailer actually (and it’s filming about 200miles north of me even). but Lincoln, I think you’re right, because of America’s history, more Americans may be more inclined to be excited about it. I know I am. Thanks for watching the trailers and commenting.